Commonly called pandas or panda bears, the giant panda is a unique and rare animal living in the wild in a small region of China. Because giant pandas were an endangered species from 1990-2016, researchers have learned a lot about these rare bears. Exploring facts about animals helps protect them from becoming endangered. There are eight different species of bears, including the giant panda. Giant pandas are one-of-a-kind bears unlike any other bear in the world. Basic facts about giant pandas give you an idea of what pandas are all about. The area where giant pandas live in the wild is much smaller today than it used to be. These bears live in small mountain ranges in Central China among bamboo forests. In the wild, each giant panda marks a boundary for the area in which it will live, and other pandas try to avoid any confrontation over territory. Giant pandas once lived in China, Vietnam and Myanmar, however now they are only found in China. About half the giant panda's natural habitat is protected by panda reserves. The Minshan and Qinling mountain ranges are where most wild pandas live today. Although they are bears and have body parts suited for eating meat, giant pandas mostly eat bamboo because they are surrounded by it. Pandas eat anywhere from 26-84 pounds of bamboo per day, depending on their age and size. 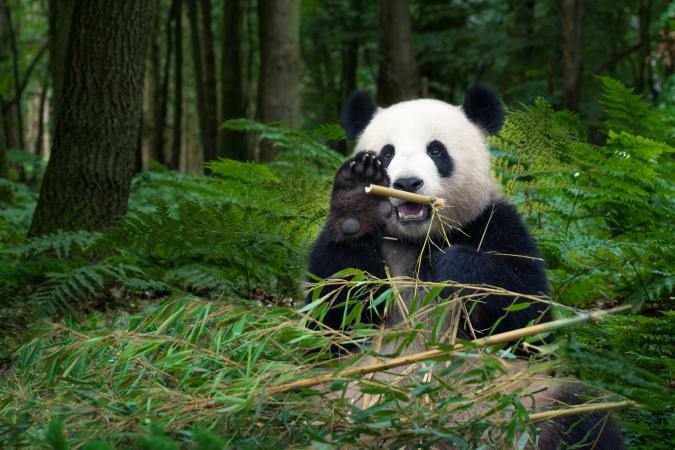 While pandas mostly eat only bamboo, they sometimes eat bugs, small animals, or other plants. Adult giant pandas have no known predators in the wild. Zoo and research experts recognize giant pandas are animals who prefer to live alone. Although mothers do care for their young, once babies are old enough, they go off and live indepently from the family structure. Like people, pandas are usually born one baby at a time, as opposed to some animals that have large litters. At birth, baby pandas are completely blind. A baby panda needs its mother to care for it until it is around three years old. Baby pandas survive on their mother's milk for about the first 10 months, then they start to eat only bamboo. Baby pandas typically weigh around 6 ounces at birth and weigh about 75 pounds by the time they turn one. Pandas do not live in families or groups except when a baby is cared for by the mother. There is only a two to three-day timeframe each year when a female panda can get pregnant. Giant pandas are easy to recognize because they don't look like any other animal. Pandas have white fur with patches of black fur around their eyes, ears, arms, and legs. There are visible physical differences that set them apart from other animals. They make different kinds of sounds like a chirp, honk, and bark, but no roar. When a panda is born it is so small the mother is 900 times bigger than the newborn. Unlike other bear species, pandas do not hibernate although they sometimes sleep for a few days at a time. A fully grown panda can be 4-6 feet long and weigh over 300 pounds. Pandas have five fingers and one thumb to help them climb trees and grab bamboo. 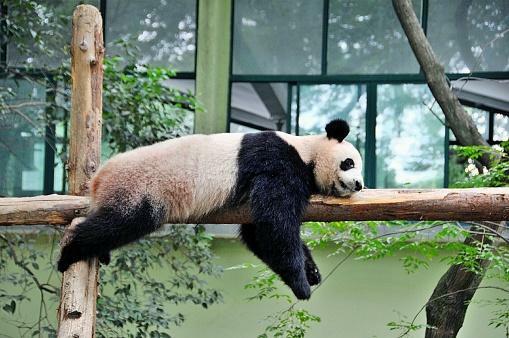 Pandas spend half their day eating and the other half sleeping. Giant pandas are often considered lazy because they are slow and spend a lot of time lying on their backs. Pandas are considered peaceful, and will only fight if they have no other options. Thanks to their fluffy white fur, black eye circles, and a lazy lifestyle, pandas have a reputation for looking cute and cuddly. Conservation is about keeping, helping, and protecting wildlife around the world so there is a natural balance of plants, animals and resources. Organizations like Smithsonian's National Zoo and Conservation Biology Institute and the World Wildlife Fund are dedicated to learning more about giant pandas and other animals so they can help keep pandas from going extinct. Around 300 pandas live in captivity in places like zoos and breeding centers. There are less than two thousand panda bears living in Central China. Pandas are not currently endangered, however, they are considered vulnerable. The biggest problem for wild pandas is logging and deforestation as these issues directly affect the natural panda habitat. The only natural habitat in the world where pandas live is in the mountains of Central China. On average, pandas live for 20-30 years. Giant pandas are truly unique animals thanks to their distinct looks, but there is one other animal called a panda. The red panda is not a kind of panda bear, but the two animals are distantly related and live in the same habitat. Red pandas are smaller than giant pandas, have reddish fur, and look more like a raccoon. Pandas look cute and cuddly which attracts the attention from children and adults. Take your giant panda education one step further with live videos, more facts, and lesson plans all about these adorable animals. National Geographic Kids offers a kid-friendly platform to explore quick facts and watch videos about pandas. Watch real pandas in real time on the National Zoo's Giant Panda Cam. Pandas and Other Endangered Animals is a quick reference guide for kids. The book is a companion to the fictional book Magic Tree House: A Perfect Time for Pandas by Mary Pope Osborne. 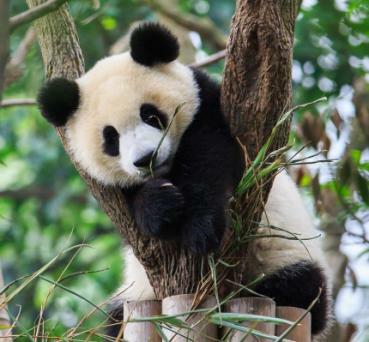 Recommended for grades 3-5 this reference guide features pictures and fun facts about Giant Pandas and more information about endangered species. To get a good look at the life of Giant Pandas, kids can watch DisneyNature's movie Born in China. The film is a documentary about three different types of animals living in China, including the Giant Panda. The Toronto Zoo offers a free online Teacher Resource and Activity Guide with over 50 pages of information, lesson plans, and worksheets for kids. The giant panda is unique even among other bears. These quiet, slow animals are far from the typical view of bears as dangerous and ferocious creatures. Get to know these interesting animals with fun facts and other resources.